L'histoire se passerait entre la fin du film et le court-métrage le mariage de Raiponce. La série a été créée par Chris Sonnenburg et Shane Prigmore. Le doublage VO est assuré par les deux voix officielles du film Mandy Moore et Zachary Levi. 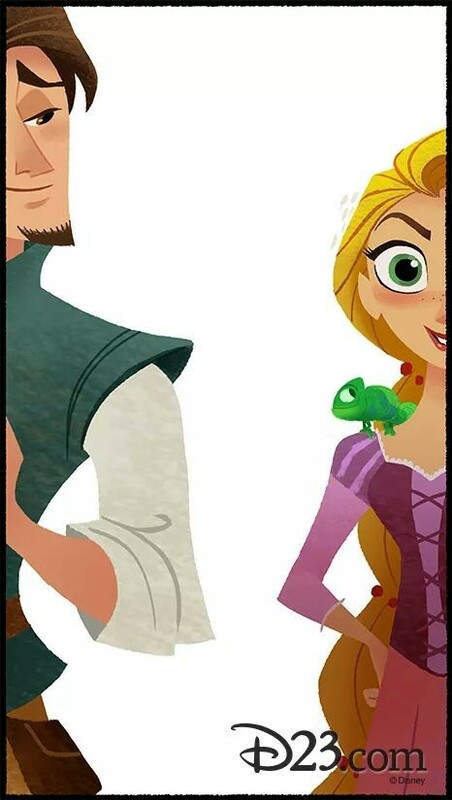 The new series takes place between the events of the feature film and the beginning of the 2012 short, Tangled Ever After, as Rapunzel acquaints herself with her parents, her kingdom, and the people of Corona. Her irrepressible spirit and natural curiosity about the world drives her to the realization that there is so much more she needs to learn before she can truly accept her royal destiny. She boldly puts her crown and impending marriage on hold to seek out epic adventures, much to the dismay of the King, who, after missing out on Rapunzel’s youth, must accept that his daughter is now an independent young woman. All of our favorite characters from the big screen will be coming to the series, including Eugene, Maximus the horse, the Snuggly Duckling Pub Thugs, a newcomer, Cassandra—a “tough as nails handmaiden”—and fan favorite Pascal, the chameleon. Sonnenberg serves as executive producer and supervising director, and Prigmore is co-executive producer/creative director. Rounding out the creative team are Jase Ricci (Teenage Mutant Ninja Turtles) as story editor, and Emmy® winner Kevin Kliesch (Tangled Ever After) is score composer. Celebrated artist Claire Keane (Frozen, Tangled), daughter of Disney Legend Glen Keane, who was animation supervisor on the feature film, consulted on the series’ development. Salut. J’ai adoré le film « Raiponce » ainsi que le court-métrage. Il me tarde de suivre les aventures de la princesse dans une série TV. Après une petite recherche en ligne, il semblerait que celle-ci soit toujours d’actualité. Le feuilleton est en préparation. Je dois patienter encore un peu… Bonne journée.